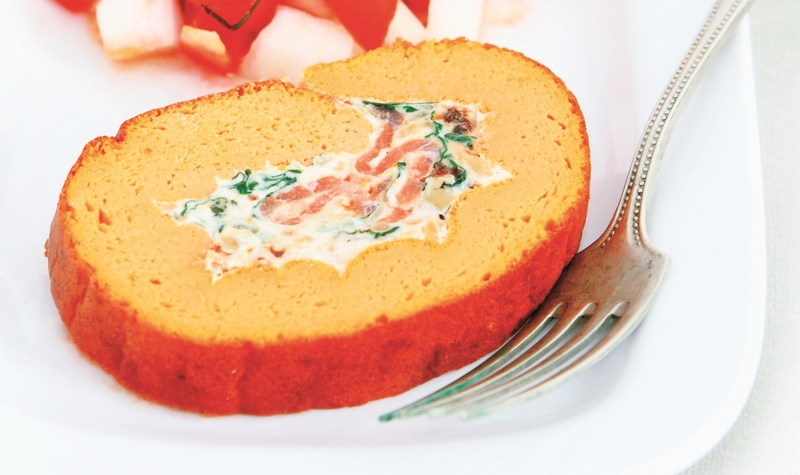 Those looking for a filling breakfast won’t be disappointed with this recipe for a delightful Tomato and Cheese Roulade. This recipe was first published in Flavours magazine. Heat oil and fry onion until soft. Beat cheese, cream, mustard and pepper until fluffy. Mix in the rest and chill. Heat oil and add flours. Cook until bubbling. Whisk in milk until thickened. Remove. Stir in cheese, tomato paste and yolks. Beat egg whites, sugar and salt to soft peaks. Fold into tomato mixture and pour into greased and lined 25x30cm Swiss roll pan. Bake in preheated oven at 180°C for 15 mins. Invert cake on parchment paper on a wire rack. Remove lining paper. Spread with cheese mixture and top with salmon. Roll up with the help of the parchment, and cling wrap. Chill before cutting.